Let be honest, we all one time or another wondered how to keep a window always on top so that no matter how you switch between windows, the target window will always be on top of the others. Putting a window on top is especially useful when you are watching videos while working or when doing research and don't want to lose focus from an important document or window. The problem is, Windows has no built-in option to set a window always on top. Sure the new Movies and TV app allow picture-in-picture mode for video consumption but it is very limited as you don't have the same functionality for other apps. The good thing is, there are several different ways to make a window stay always on top of other windows. I'm showing different methods to keep a window always on top. All the methods shown below achieve the same result. Use the one you are comfortable. AutoHotkey is one of my favorite software. In fact, I use it daily to open my daily used programs with custom shortcuts. The best thing about AutoHotkey is that it is very lightweight and easy to use. One of the things I use AutoHotkey is to set a target window on top of others when I press a keyboard shortcut. 1. First, download and install AutoHotkey. After installing, you will not see any user interface. 2. Now, you need to create a custom AutoHotkey script. To do that, create a new text file. Next, copy and paste the below code in the text file. 3. 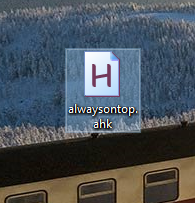 Save the file as "alwaysontop.ahk". The .ahk extension is important. 4. That is it. Double-click on the newly created AutoHotkey script. From now on, you can set any window on top by simply selecting the window and then pressing the keyboard shortcut Ctrl + Shift + Space. If you want to customize the keyboard shortcut, here's a helpful page you can follow. To reset always on top window, press the keyboard shortcut again. WindowTop is a simple and portable software to make a window stay on top. What's special about WindowTop is that it has a few other interesting features like the ability to change the opacity of a target window and enable dark mode. If you don't like dealing with scripts then WindowTop is a pretty good choice. These additional features are available only to pro users though. 1. First download WindowTop, extract it, go to the Portable folder in it and double click on the "WindowTop.exe" file. 2. As soon as you open the application, all your windows will have a new drop-down that appears when you hover over the title bar. Expand the drop-down menu and select the "Set Top" options to keep a window always on top. To reset the window, click on the "Set Top" option again. If you are looking for a much simpler software then TurboTop is the one. Just go here, download TurboTo and install like any other software. Once installed, launch TurboTop from the start menu and, click on the taskbar icon. You will see a list of all the available app windows you can set on top. Just select the window that you want to stay always on top. That is it. It is that simple to keep a window on top. If you like this article then you might also like to how to change mouse pointer color and size, how to change default PDF viewer on Windows 10, and how to rename chrome tabs. Do check them out.